Take your game room to the next level with this officially licensed Game Room Combo Set. 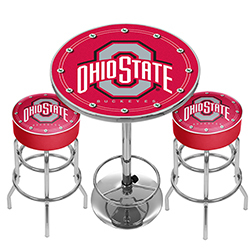 The set features two stools and one table to help complete that empty spot in your game room, garage or collection. This commercial grade furniture will not let you down. The stool seat features an authentic logo highlighted by durable marine grade vinyl sides and top trimmed with quarter inch vinyl beading. The seat also includes luxurious foam padding and a 360 degree swivel. Chrome double rung reinforced legs are made of tubular steel that is both lightweight and supportive. The table top features full color licensed artwork preserved under coated acrylic to prevent scratching. The table top is trimmed with chrome finished poly-resin banding and is supported by a chrome base with adjustable foot rest.